…”The news of what seemed as a calamity spread across the nation and the world. It was on blogs, the internet, in newspapers on the news and everywhere. The same spreading of the dried brook is the same spread your going to get when you come out”. Look at God! After a three year court battle, Bishop Joel Peebles is back at the Jericho City of Praise, the church his family built into one of the Washington area’s largest and best-known houses of worship. Last month, D.C. Superior Court Judge Stuart G. Nash ruled that in 2009, Peebles was improperly removed from the board of trustees of the church started by his mother, Apostle Betty Peebles and that subsequent actions taken by the board, including firing Peebles as pastor after his mother’s death, were invalid. So on Monday, Peebles returned to the building he had been evicted from several years ago. Two days later, Rev. Jasmin Sculark, who had been hired by the Jericho City of Praise Board of Directors, issued a statement, effectively resigning from her position as the church’s pastor…. Hamil Harris is currently a multi-platform reporter on the Local Desk of The Washington Post. I am so elated God restored what was stolen from you. I praise and thank God for Pastors Peebles and the Jericho family for being living epistles for Jesus Christ. I look forward to worshipping with you at the Jericho City of Praise on Landover, Md. To God be the glory for the great things He has done. In another off topic moment, after a long hard fought battle, Joel Peebles, the son of the late Betty Peebles, and the City of Praise mega church people received news from the courts that they may return to the original property. A lot of real crazy stuff went into this battle. 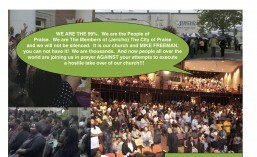 Several players like Pastor Michael Freeman, who was severely incapacitated (judged by God for meddling in my opinion) some time after having Joel Peebles escorted out of the church property, and the rogue Board of trustees that filed lawsuit after lawsuit to keep the control of the church, Jasmine Sculark, a firebrand preacher, who was installed as pastor by Bishop T D Jakes, and other players made this a very ugly episode on the world stage. Over the course of time, many statements have been made by commenters about this debacle. Time will tell who will emerge as unscathed of this but one thing is certain, those who did wrong will stand before the Master to render an account. I do not think that Joel Peebles was in the wrong. It was determined by the courts, and properly so, that he was wrongly removed from the Board, thus facilitating a church takeover over money. As Paul stated in the Scriptures, paraphrasing, that we couldn’t even judge this among ourselves, and we do this before the world. That’s because when we do this among ourselves, we can’t trust ourselves. Therefore, the rule of law, as it relates to Bylaws, Church Meeting Minutes, Church Monetary Records, Church Constitutions, Articles Of Incorporations, and other legal church instruments, must be kept up to date, and in order. Apparently, Joel Peebles and his attorney ensured that they had their stuff together, as they were allowed to return to the original church property. Let this be a lesson to us all that there is a greater fight in the realm of the spirit for the souls of men. When we are consumed with earthly treasures, we bankrupt ourselves of the presence of the Lord. Time and effort was wasted. Wasted in the sense that when the wrong people view church as a business only venture with money, souls means nothing. This is not to say that Joel Peebles was about the money or the property, because the rightful owner of all things is the Lord Jesus Christ. Joel Peebles was acting as the steward of what was entrusted in his care. Had he been wrong, the outcome would have been different. The Bible is filled with all sorts of disputes in both testaments because of the hearts of men. Disputes will continue because of the hearts of men. The place where we least expect disputes is the house of worship, but just because it is a house of worship, it doesn’t mean that there will never be a dispute. How the dispute is handled reveals the true intent of people that worship God. If anything is of God, it will not fall into the hands of the wrong. If anything is not of God, the wrong will undoubtedly be on the short end of the stick with a boomerang effect. While this will be judged by the Lord at the Judgment Seat of Christ, if sin was committed, it is best that any and all parties check their hearts and ask the Lord for forgiveness. To say that no sin was committed is pride. And yes, that sin will be judged. Now that this episode is over, perhaps, the people involved will do some serious soul searching and reflection. The devil has had his day and it is time to do work for the kingdom. How these persons play out the rest of their respective ministries is completely up to how close they want to be to the Lord to perform His will in the earth. Trivial matters must be dealt a death blow. As one person said it very well. We must pay attention to the main issue and not get side tracked with side issues. It is very easy to be distracted when our prize becomes something or someone else than Jesus and His will. After Michael Freeman’s (who has three church properties in Maryland) brush with death and Jasmine Sculark being side lined from City of Praise, every preacher need to examine themselves to determine that our motives are consistent with the directives of the Head of the Church. God Bless and So Happy, that what was right was executed and recognized in a Court of Law. The Plan of Satan, didnt work. Unfortunately you have to work in this world for what you want, not try to plot and steal and use schemes and lie. This was an attack of course from the demon world but he used Willing supposed Woman and Men of God to attack a ministry. Also Satan deceived mega ministers to put there 2 senses in this battle and comments and decisions were made against Jericho Church that were all Lies from the beginning. But you know what, this is a day where, you better know The Lord for yourself and forget a name , a title , a car, a label you better be sealed with the Holy Ghost. Because that Seal will keep you till the day of redemption. When i found out what happened I prayed that God help you and made your battle my very own. And to God be the Glory and Jericho City of Praise I have to admit you are a Real Church Blood washed and chosen men and woman of God, Joel Peebles and Wife , God bless you and keep the Good Fight of Faith. Knowing like David Said, I have set the Lord at my Right hand. and I shall never be Shaken.